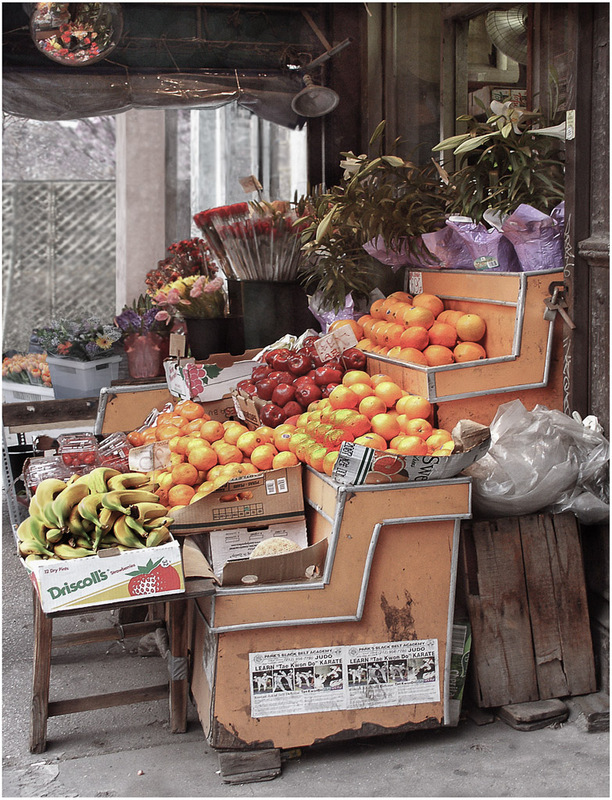 The area called Hell's Kitchen on 9th Avenue has become a food shoppers delight. 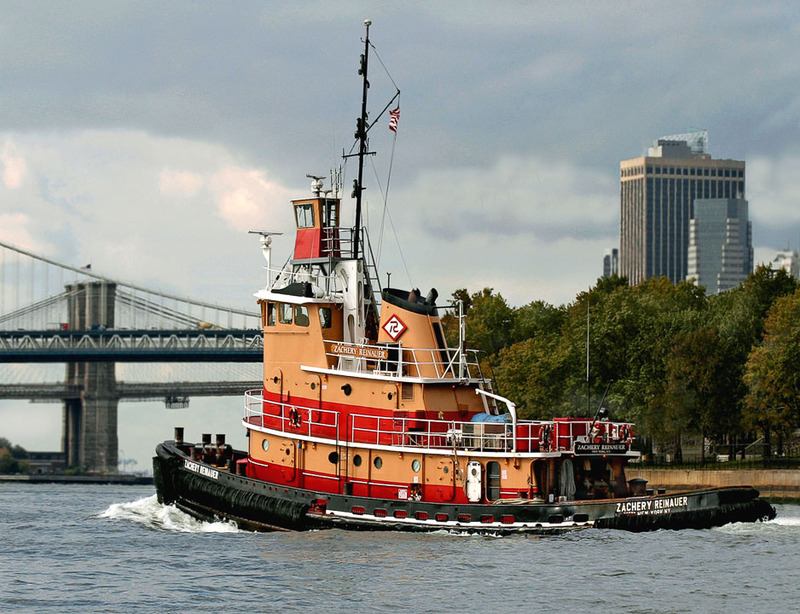 The tug is heading downtown towards the lower tip of Manhattan. 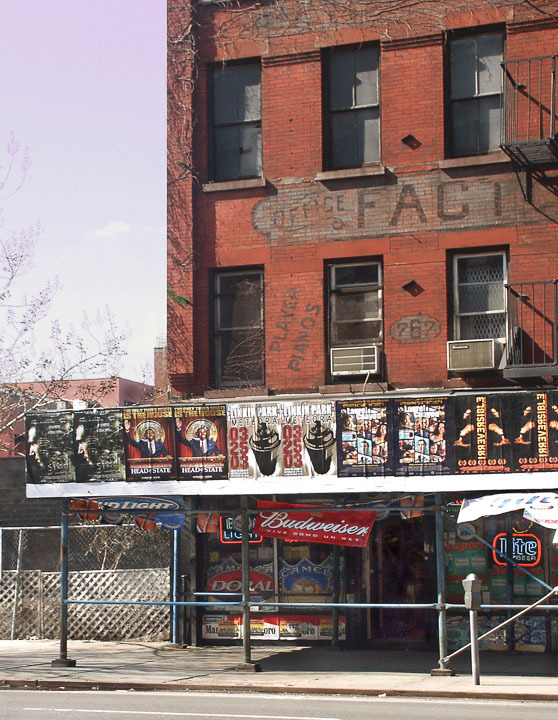 A Hell's Kitchen store that caters to smokers and drinkers. 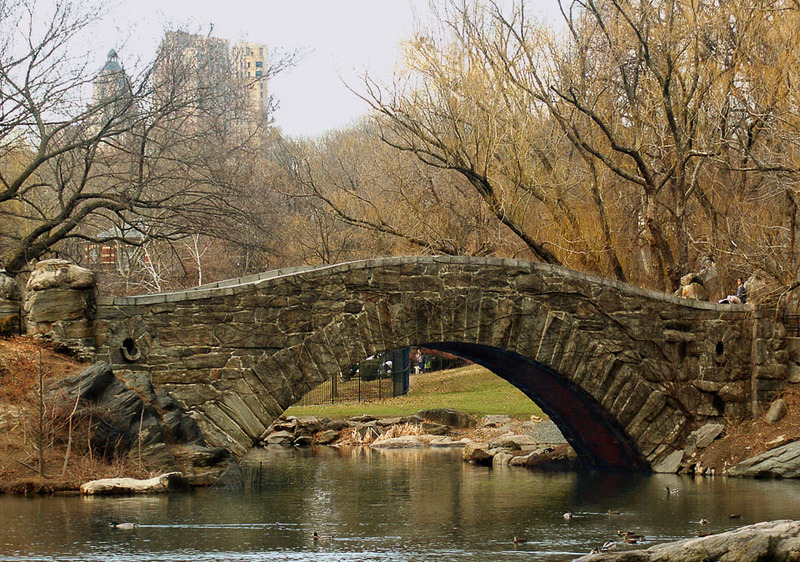 Central Park's lake and stone bridge offer a peaceful refuge in a hectic city. 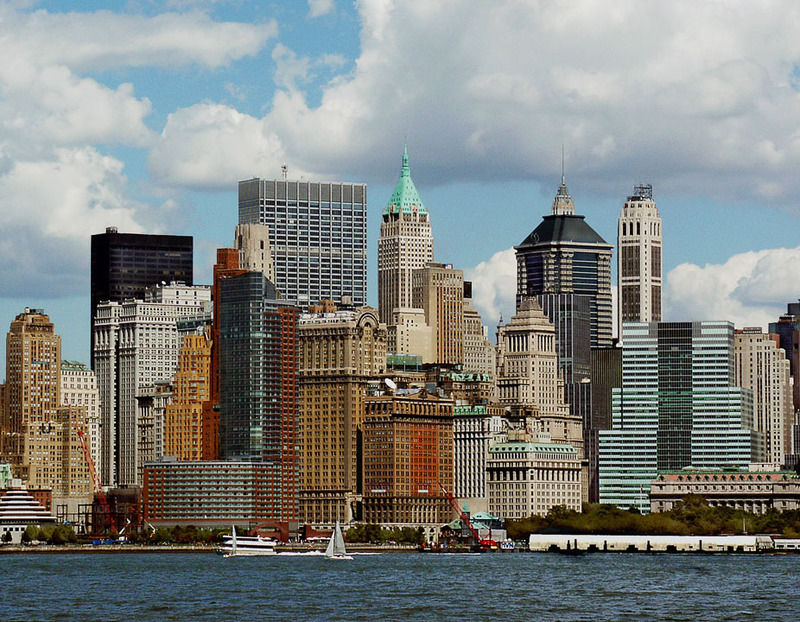 Downtown seen from the Jersey side, minus the World Trade Center. 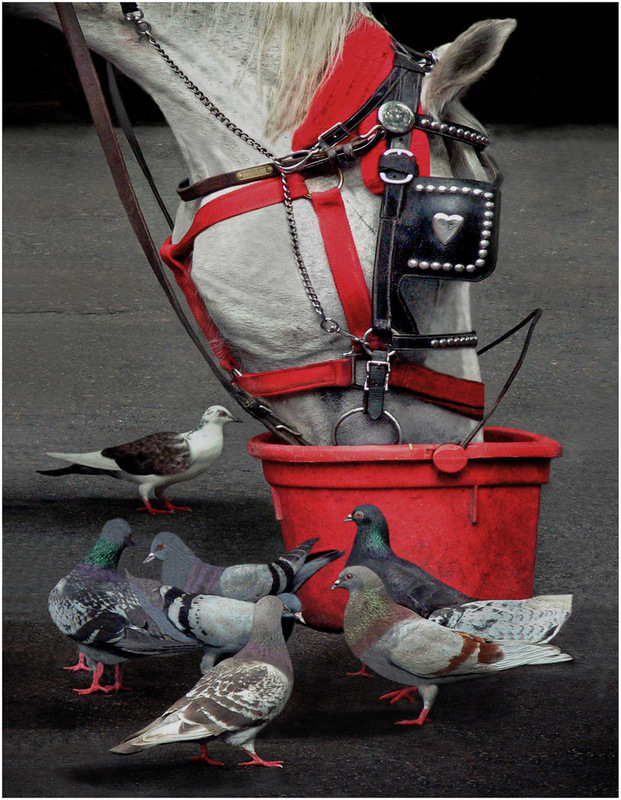 The birds hope that the Central Park carriage horse is into sharing. Rush hour as day workers head home and theater goers begin to arrive. 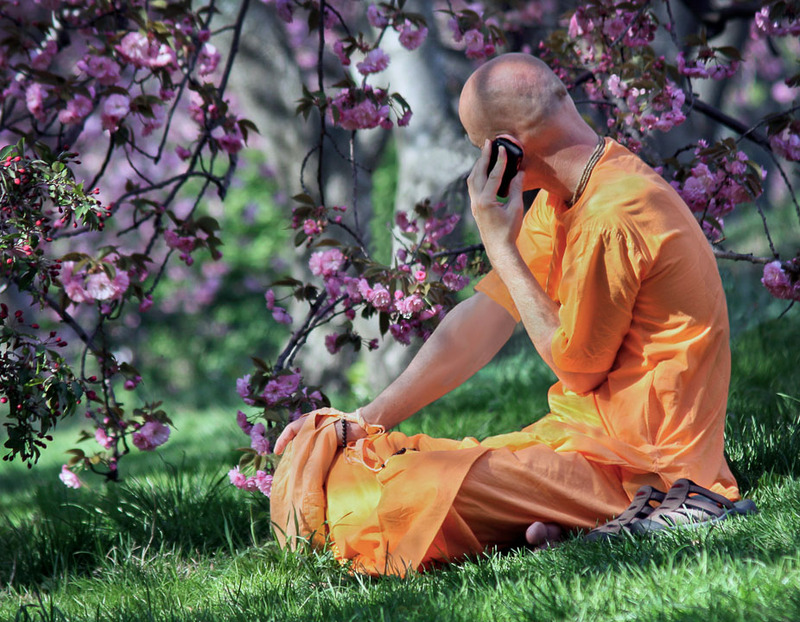 Cell phones often contribute to keeping people apart rather than connecting with each other. 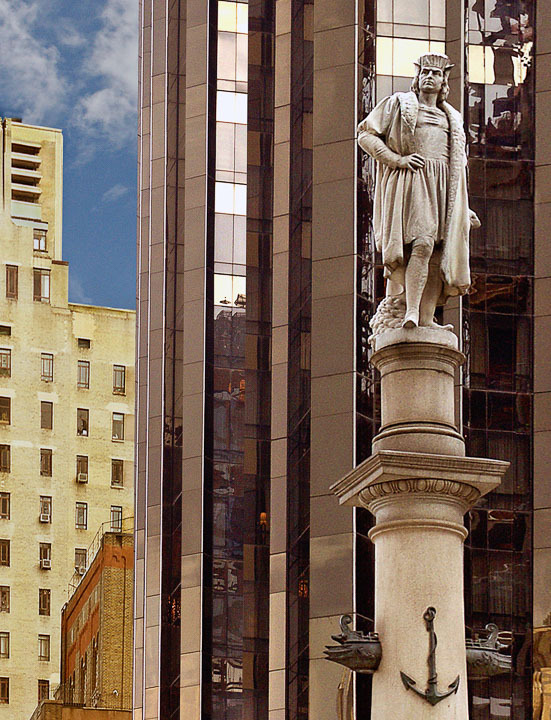 His statue stands at Columbus Circle, 59th St. and Central Park West. 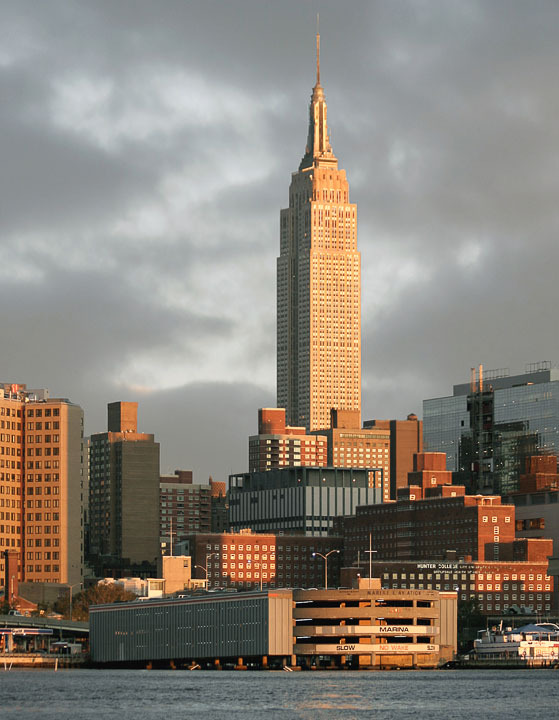 The Empire State Building is no longer the city's tallest building. 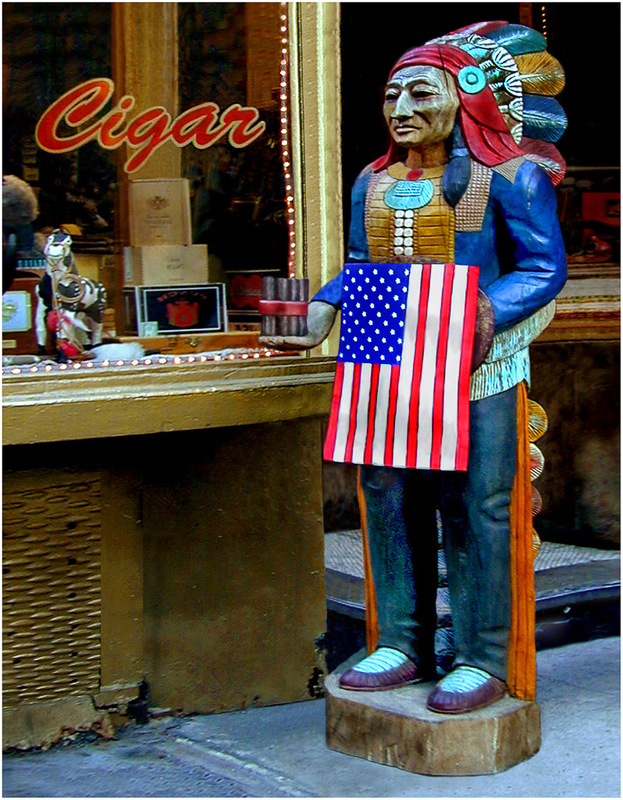 A cigar store indian in Little Italy holds the American flag after 9/11. 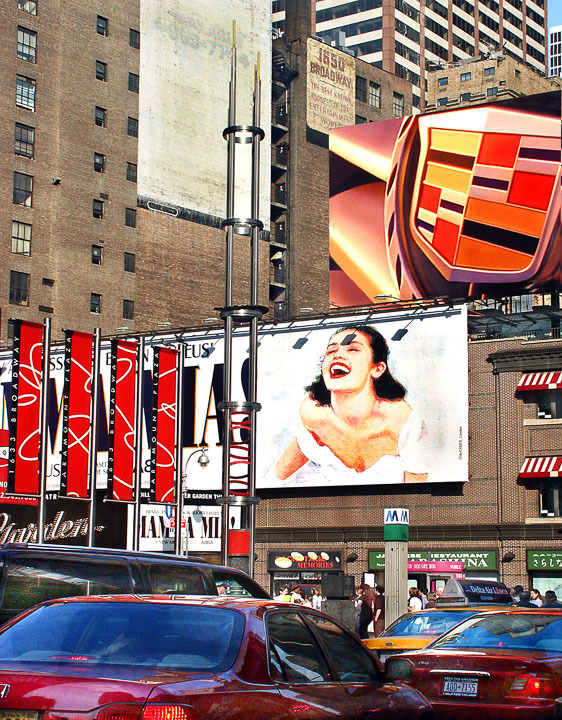 A golden hand at the entrance to Madame Toussaud's Wax Museum on 42nd Street. 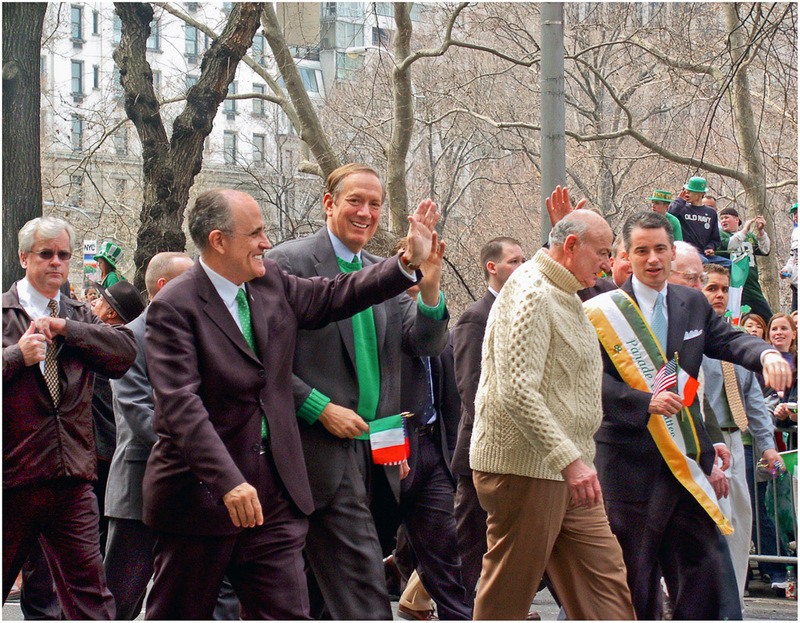 Guiliani, Pataki, Koch and McGreevey marching on St. Patrick's Day 2003. 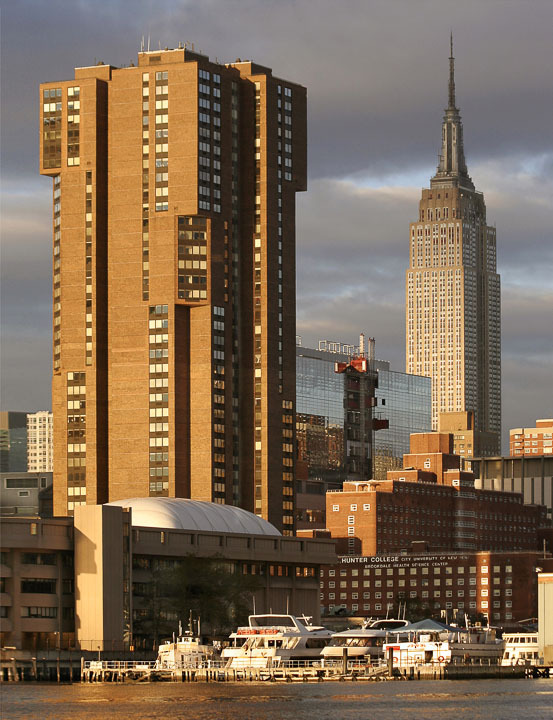 The Empire State Building and an East River marina glow in the early morning sun. 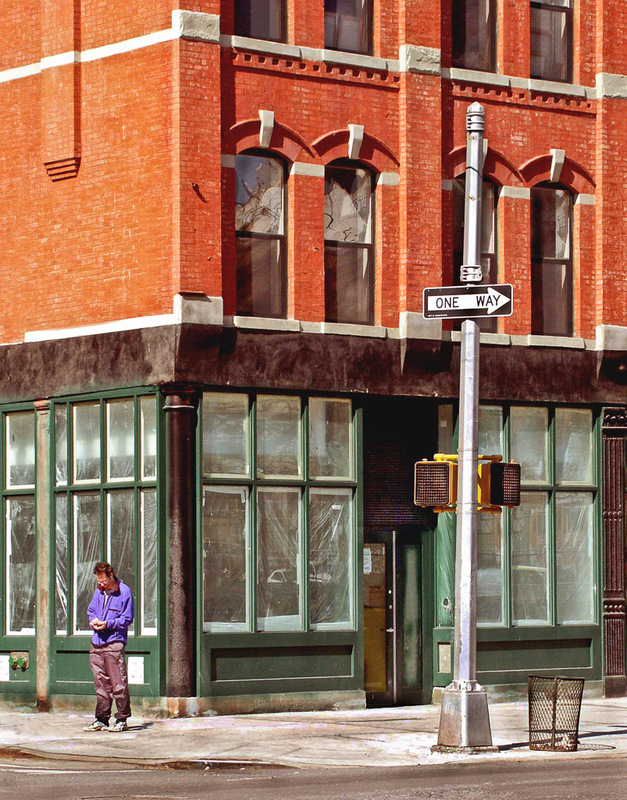 A man stands alone on 9th Ave. in the Hell's Kitchen neighborhood. 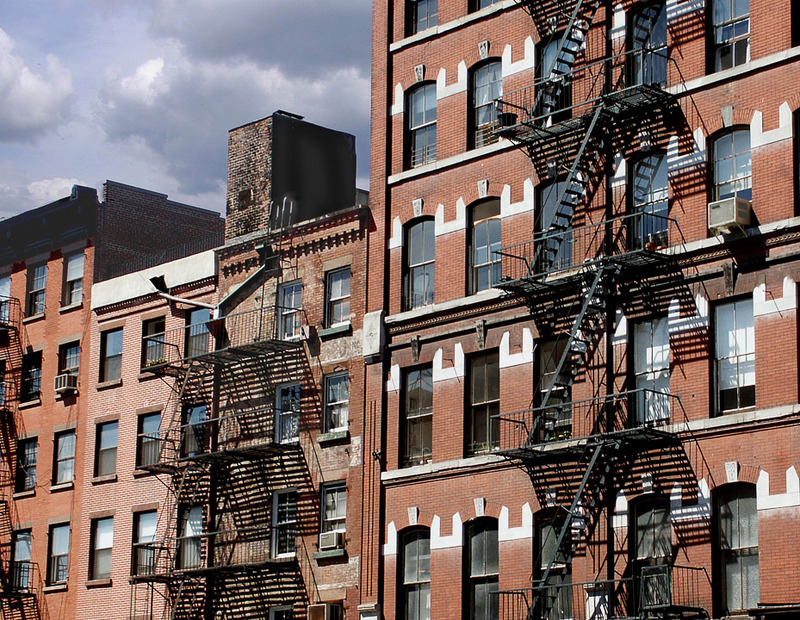 Fire escapes and architectural details create interesting patterns in Tribeca. 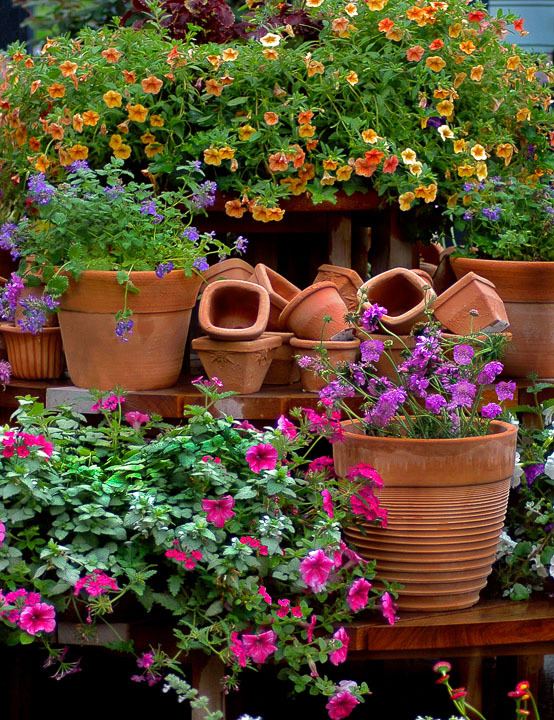 Terra cotta pots and colorful flowers at the New York Bronx Botanical Garden. 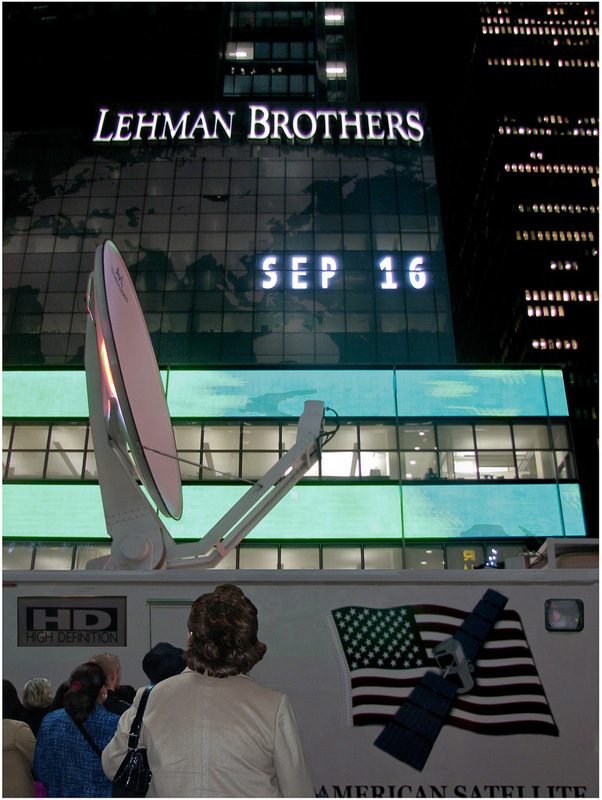 Shock and awe as Lehman Brothers collapses in 2008. 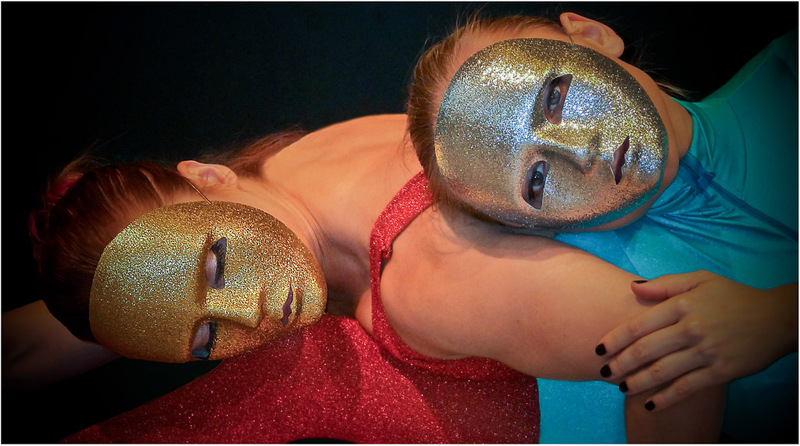 Two of many young women who earn their living as models in NYC strike a pose. The Manhattan Bridge and Brooklyn Bridge at the lower end of the East River. 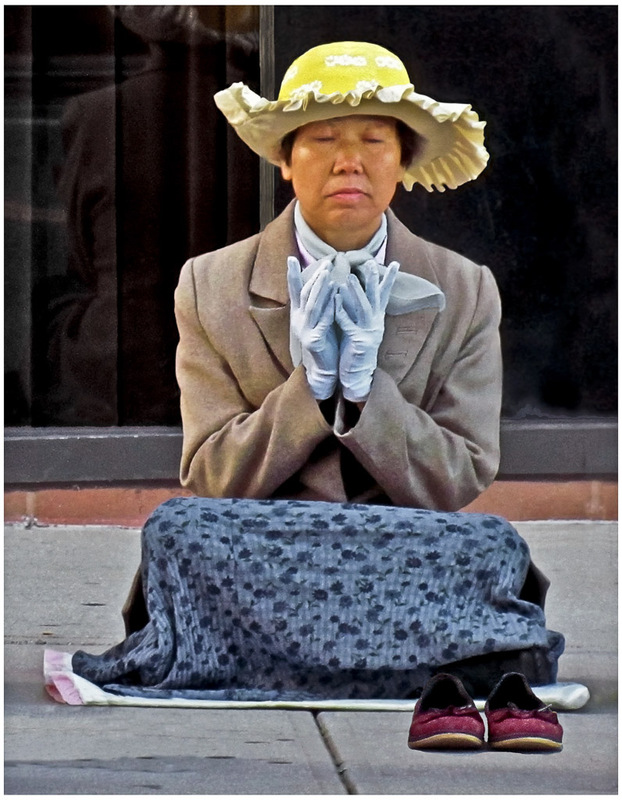 This group has been protesting daily outside the Chinese Consulate for over 10 years. 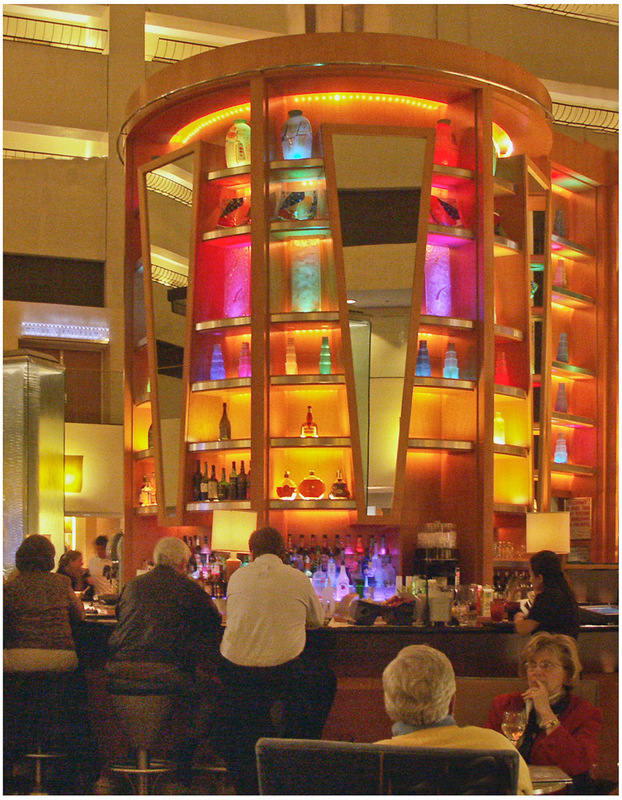 5PM and time for a drink and an attitude adjustment. Everyone seems to be attached to a cell phone these days. 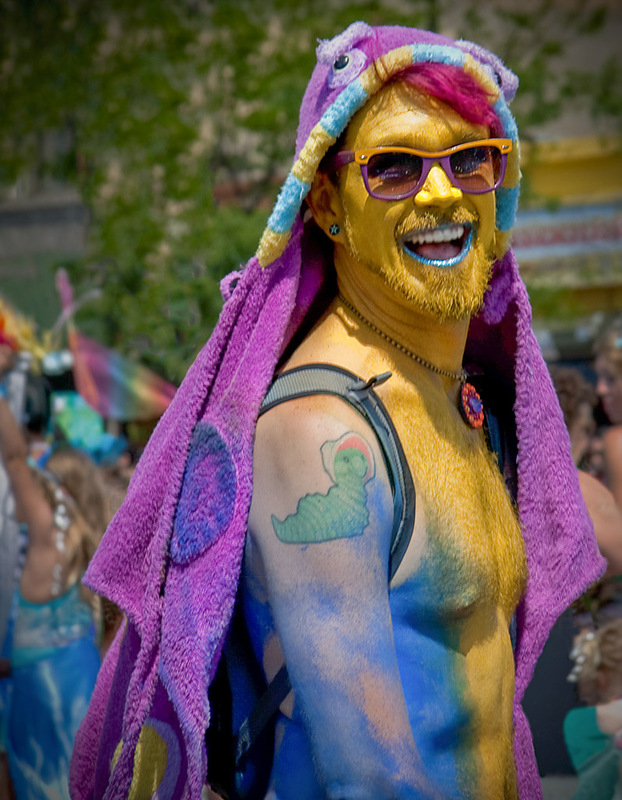 A happy participant in the annual Coney Island Mermaid Parade. 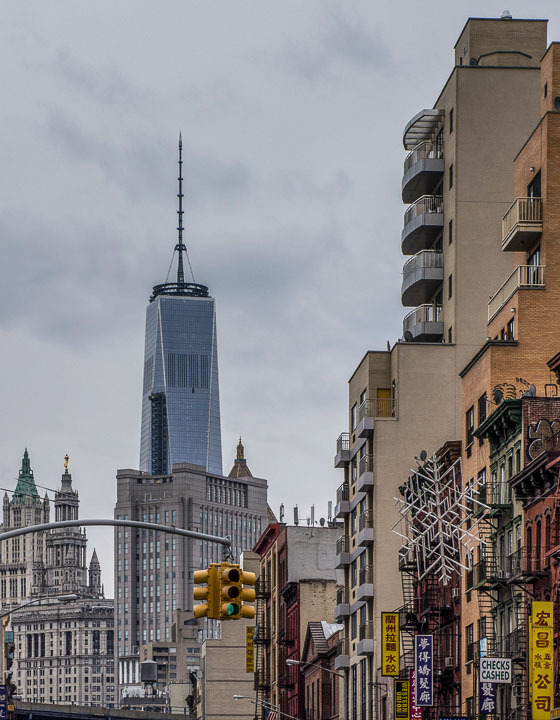 At least that's what their sign says for these two on 9th Ave. in Hell's Kitchen. State of the tower's construction in August 2012. 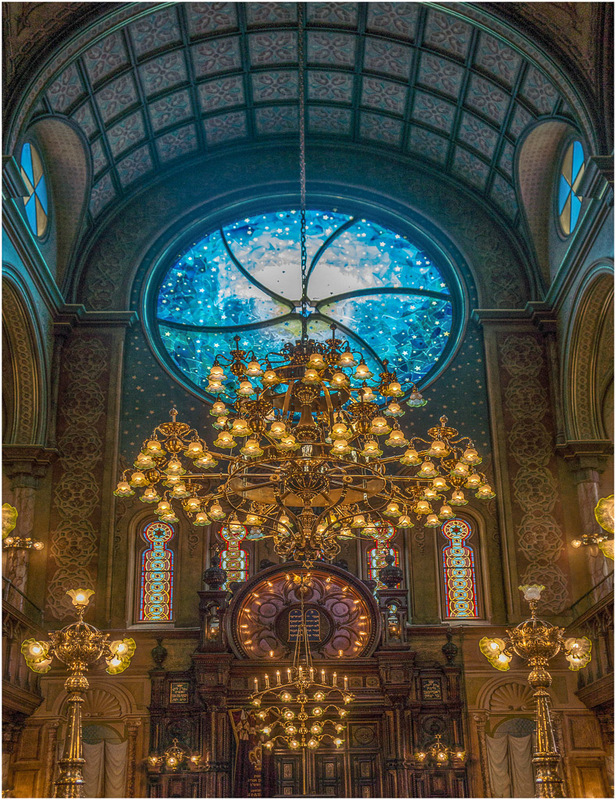 One of the 1st synagogues erected in the U.S. by Eastern European Jews on the lower East Side. 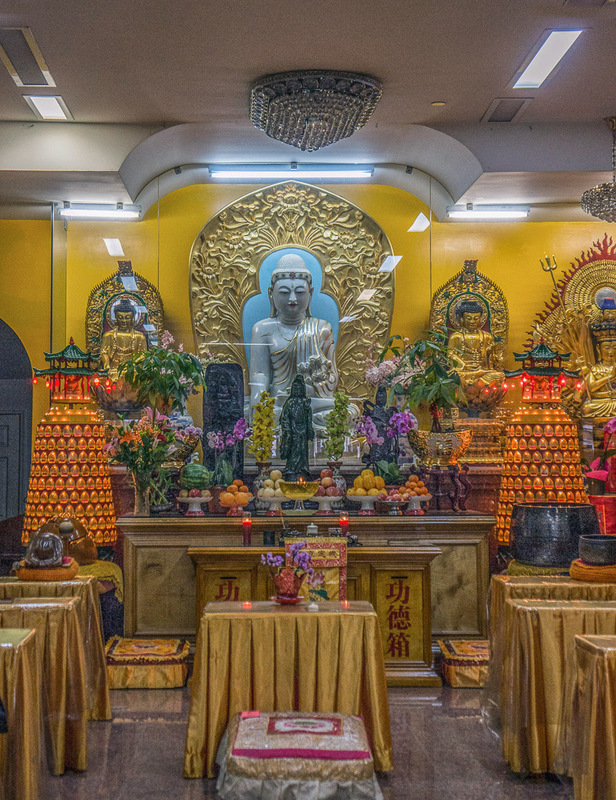 This temple is located in Chinatown in New York's lower East Side. 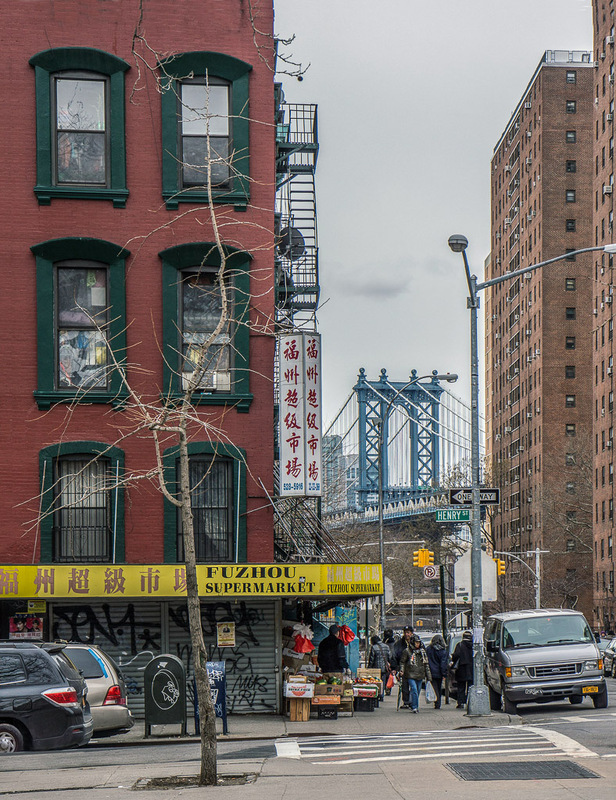 The Manhattan Bridge to Brooklyn viewed from a Chinatown street corner. 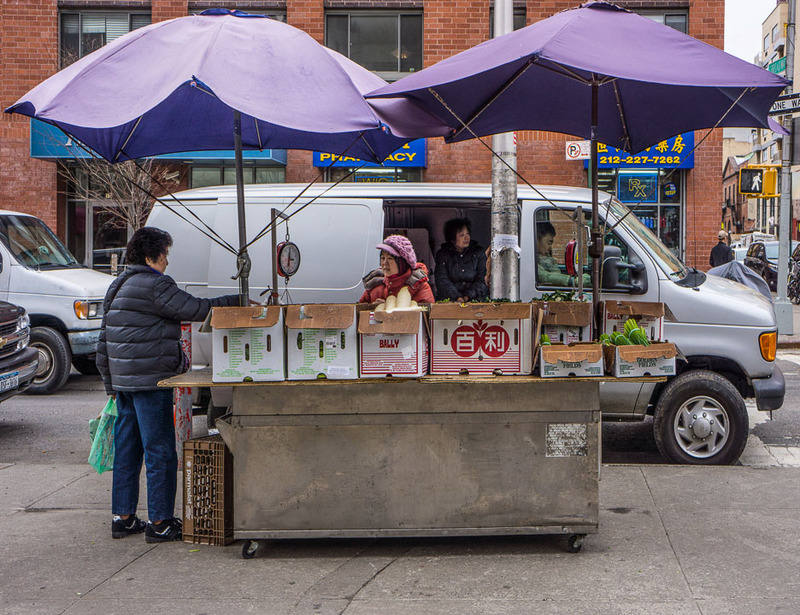 Like so many NYC vendors, she operates her business out of her van. 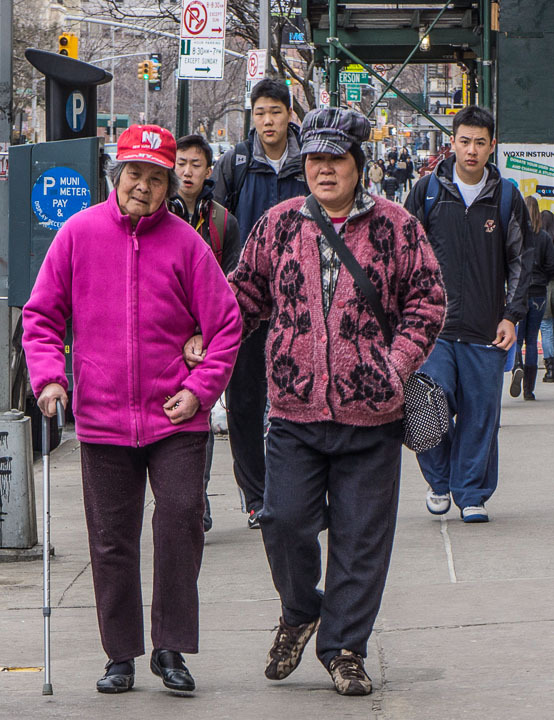 Two old friends out for a stroll in Chinatown. 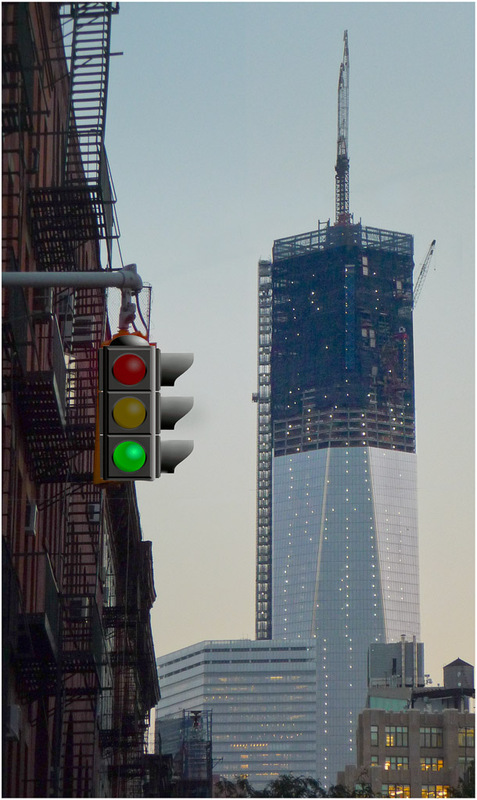 The almost completed tower viewed from a Chinatown street corner in 2013. 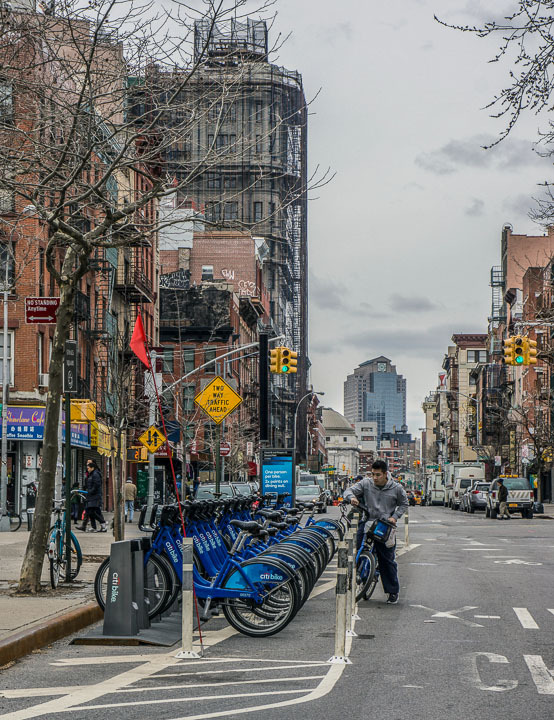 Rental bikes have become a popular way to get around the city. 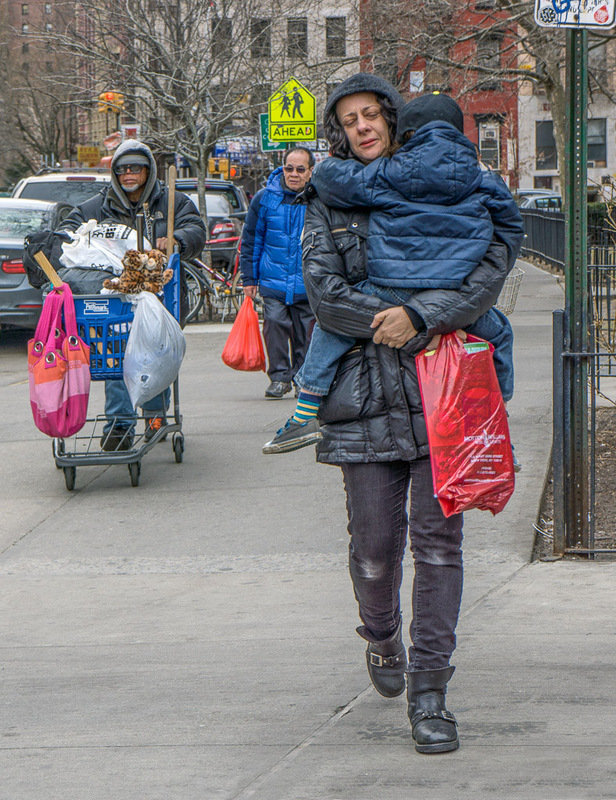 A tired mom in New York City.